Marina views and Cal-Mex cuisine on Shelter Island. : Miguel’s is part of the Brigantine family of restaurants and has several outposts in San Diego. On Shelter Island, enjoy the comfortable second-story setting that caters to locals and vacationers alike; it’s a place that happily handles big families and other large groups, whether in the main dining room or in one of the three banquet rooms. The Cal/Mexican fare includes nachos, fried-fish tacos, mild enchiladas, hearty burritos and gargantuan margaritas. 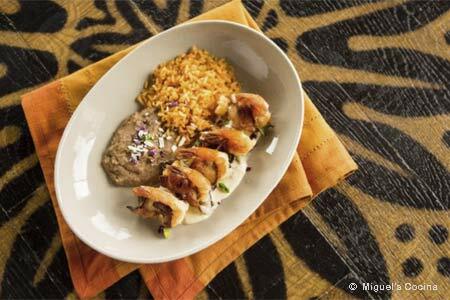 The signature fajitas feature skirt steak, portobello mushrooms, wild Mexican shrimp or citrus chicken. A standout specialty is Miguel’s mariscos --- a medley of swordfish, calamari, Mexican shrimp and mussels in a spicy tomato broth.